I just love my music, so it’s likely no accident that I live with Greg, who’s a music teacher and that I have a wall height shelf filled with my CD collection. Rhythm is an essential feature of music, language and the brain. Many of us have experienced being moved to tears by a piece of music, or lifted in spirit and feeling elated after hearing a powerful song. After you LOG IN you will be introduced to some of my favorites. 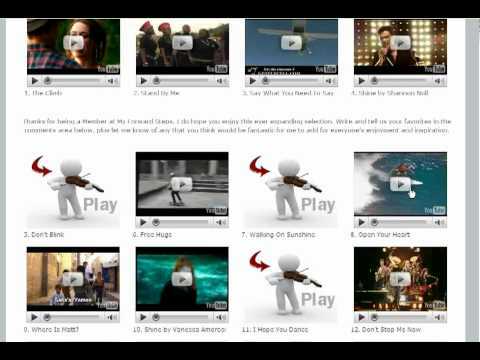 I have selected these Inspiring, Upbeat, Motivating Music videos for their positive lyrics and upbeat tunes, having read through the lyrics of most, if not all, and listened to some songs several times to “feel” that they help energize the spirit. If not the song, then the video to accompany the music, inspires. Whenever you need a lift, just revisit this page and turn up the volume! I will be adding to the music collection over time, so do return occasionally and check in with what’s new. I will later explore playlists, and find a way to have a player that can play these songs in a continuous stream that we can open up and play in the background while working. Alternatively, use this collection to build up your own playlist in iTunes and then adding it to your own player device.